Despite common perceptions, Black men have long been industrious. And evidently my grandfather Riley was as hardworking as men of any race come. I call him a Black entrepreneur, but back then industrious is the word people used. I archive and keep our family’s history. I have scoured over family artifacts and Census data. Some time in the mid-1800s on the McGimpsey farm in Burke County, North Carolina, a slave named Clarissa gave birth to a son she named Riley. While born into slavery, Riley eventually became a sharecropper who sold his part of the produce—corn, wheat, molasses and such. Documents I have come across show his products sold as far away as Mullins, South Carolina, which was hundreds of miles from the farmland of Fonta Flora. He even owned one of the county’s few reaper-binders and loaned it out to others. Fondly remembered and respected by people all over the county, my grandfather prospered in farming and with various small enterprises. He grew well known for giving away fresh produce and all kinds of things to community people, regardless of color. Riley was born a slave, but died an entrepreneur and philanthropist. Don’t let a meager start or scant resources limit what you do in life. 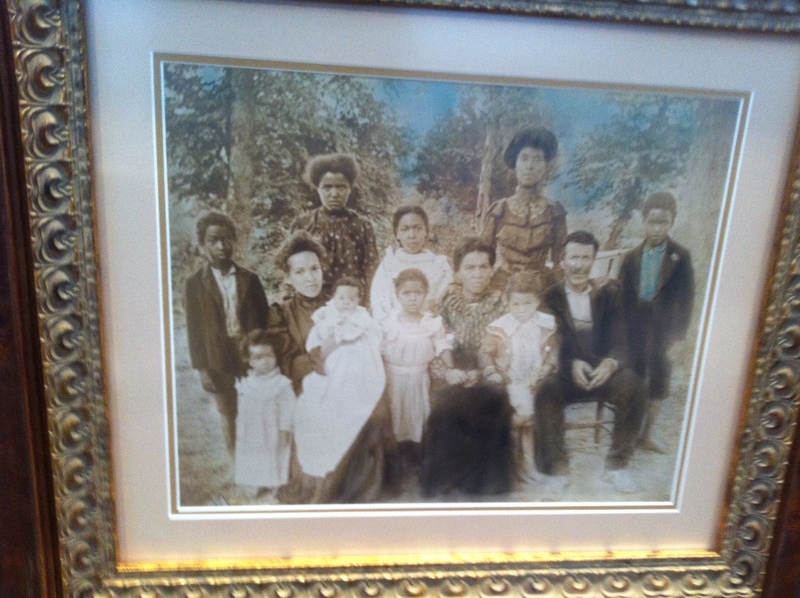 The portrait above is on display at the History Museum of Burke County. Riley is seated on the far right and his wife Christian V. Moore McGimpsey is seated next to him. Their daughter Mary Maldonia, who is my great-grandmother is seated on the far left. Fast forward one hundred and ten years: There will be a family reunion this summer, kicking off at the History Museum of Burke County, with five more generations—the far-flung descendants of Maldonia McGimpsey and the man she would later marry John Wesley Fullwood. Cannot wait! This entry was posted in Family, love, multi-generational and tagged Burke County, Clarissa, Family, Fonta Flora, Fullwood, generations, Giving Back A Tribute to Generations of African American Philanthropists, History Museum of Burke County, Maldonia, McGimpsey, Morganton, multigenerational, Nettie McIntosh, North Carolina, Riley, Valaida Fullwood by valaida. Bookmark the permalink. Sharing this blog post again in memory of my cousin and fiercest of family historians Mrs. Nettie McGimpsey McIntosh, who passed on and was delivered home today. Rest in power and peace. This is awesome. My family is connected with you all!! !